On a quiet, cool evening, just days before Myanmar’s first elections in 20 years, a rowdy group of vibrant, middle-aged men sat comfortably in a softly-lit, charming “tea shop” along the narrow streets of Mae Sot in western Thailand. They were cloaked in a pungent cloud of smoke from imported cigars called “Heaven”. The heady aroma like that of a weathered carpet left out in the rain too long. A bucket of ice, some glasses, and a half-empty bottle of local rum stood like chess pieces on the table. On the walls – old photographs and muted paintings: the Argentine revolutionary Che Guevarra, Burmese Nobel Peace prize laureate Aung San Suu Kyi, and other iconic rainbow images of endless ethnic faces. Scattered amongst that were banners and stickers calling for “freedom” and “peace” in all sorts of pained places. Africa. Latin America. China. Southeast Asia. Ironically, caged fish swam around in a small tank by the well-worn sofa. Almost invisible had the water not seemed to glow under the light of a tiny bulb. The scene – held together by a soulful African tune entwining its supple branches through the evening’s weary radiance. Loud, raucous laughter erupted frequently from the crowded table of middle-aged men. The camaraderie evident, and the energy vibrating from them almost tangible despite their seemingly relaxed demeanour. It was like a reunion of old school friends who hadn’t seen each other in years… and yet, there was also an air of familiarity about them – as if they gathered like this every week. And maybe, they did. In another lifetime. Or “on another planet,” as they joked. They were, after all, a unique “band of brothers”. A handful of comrades inebriated on the freedom denied them for so long. All of them former political prisoners from Myanmar seeking refuge here, across the narrow river, in Thailand. Eighteen years he was in prison for opposing the military junta that continues to rule his nation. His father, an army officer, was dismissed from service for the errant son’s “extra-curricular” activities. When the ex-Colonel died, his incarcerated son didn’t find out until a decade later. He looks directly into your eyes and smiles, but there is still a faint tint of uncertainty in that statement hidden in the folds of his strong voice. His family held a memorial service for him years ago – believing he was dead. Thiha says it was an “unusual” reality he was released into after serving his time for high treason. An unknown world where names and places had changed, and the 3-month old daughter he’d had to leave behind was now a young woman in university and hiding a boyfriend from him, her only living parent. He laughs at the thought, and it is clear the idea almost makes him feel closer to his grown-up ‘baby’. It’s a usual thing for children to do, he offers, and besides, he is “still a stranger to her” after all. “I was brutally tortured in prison. I have lots of wounds. My ribs, my head… everything… broken… but I was lucky… I can say now. I survived. I can stand. Many others died in prison. There are others in worse positions than me.” His smile is brighter than the fish tank’s light, and it is clear he means it. A few minutes listening to the chatter at this table and it is evident that for these men, despite all they’ve been through, the proverbial glass is always half-full. There are many, they say, with similar stories and similar scars who have managed to remain just as optimistic. 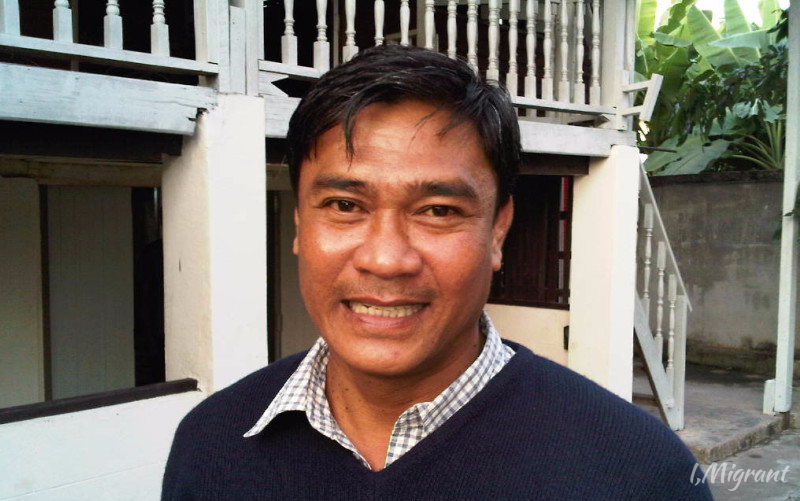 “Things won’t change so easily in Burma; we have to be patient,” Thiha says. It is a table of patient, undefeated men who still struggle but count themselves lucky. “We have filed for asylum,” says another in the group. “But the Thai government and the UNHCR seem to be playing volleyball with our status.” He guffaws, as do the others, in on the joke, who mimic passing a ball around. More laughter from these patient men as the joker gets up to head home. “He still won’t tell us where he lives,” says Thiha. “It is like some big secret for him – so the SPDC can’t find him.” A paranoia he got used to living across the river under a military regime. It is a fear they all have. Of the enemy still being able to hunt them down one by one. “Sometimes, I think prison is better,” Thiha, the vocal one, shares. At least it is a world he knows how to navigate, he says. The deceptive comfort of habit. But the almost well-concealed sadness in his eyes lets you know he doesn’t really mean it. There is a sullen sadness in all their eyes. Sprinkled with a small spattering of hope. These men have lost years of their lives – and yet, they have no regrets. They are alive – and free. And continue to fight for change in their homeland. In a cosy café dedicated to freedom, with nostalgia dripping from the walls, a group of patient men – youthful and idealistic still – sit and wonder about their nation’s future across the nearby river. They raise their glasses in longing, and toast to return home. They are alive and free… and they can wait. The soothing gravel voice of Louis Armstrong beings to cry out of the speakers over head. Thiha Yarzar, in Thailand, 2010. 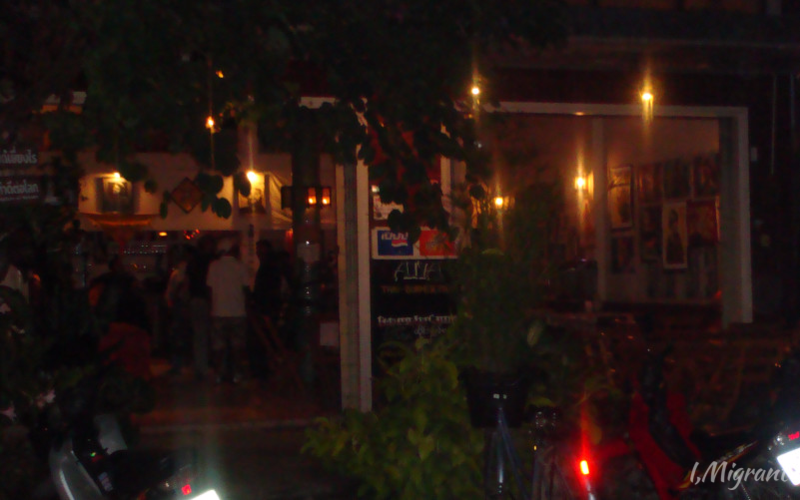 UPDATE: The Burmese political refugees went on to run their own bar/café in Mae Sot for several years. It was meant to be an “open space” for socialising and cultural exchange. Thiha Yarzar was considered “illegal” for the three years he was in Thailand, since the country isn’t a signatory to the UN’s International Refugee Convention. He was detained several times, and was under constant threat of deportation. In 2012, he moved to Australia, legally, and started a new life. He is still actively campaigning for change in Burma, disappointed in the country’s “new” leadership. An earlier version was first published by Al Jazeera English.